"A family favourite that fills the house with a cinnamon aroma. A delicious plum dessert, dusted with icing sugar!" Preheat the oven to 375 degrees F (190 degrees C). Butter a 10 inch pie plate, and sprinkle 1 tablespoon of sugar over the bottom. 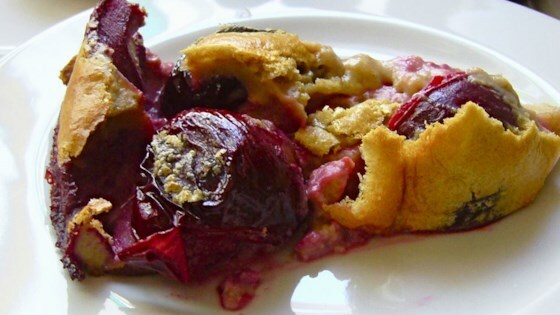 Arrange the plum halves, cut side down, so that they cover the entire bottom of the pie plate. Sprinkle 2 tablespoons of sugar over the top of the plums. In a blender, combine the remaining 3 tablespoons of sugar, eggs, milk, flour, lemon zest, cinnamon, vanilla, and salt. Process until smooth, about 2 minutes. Pour over the fruit in the pan. Bake for 50 to 60 minutes in the preheated oven, or until firm and lightly browned. Let stand 5 minutes before slicing. Dust with confectioners' sugar before serving. Watch how to make a classic French cherry clafoutis! Incredible! Tastes exactly like traditional French clafoutis but it's low fat! A definite keeper, thanks for posting! This is absolutely delicious served chilled with ice cream or english custard!